As an undergraduate in college, I worked as a shoe salesperson for the now-defunct Mervyns department store. The soothing strains of Faith No More on Musak played as we straightened neon hiking boots and striped ballet flats and assorted white high tops on plexiglass rounders. There was a strange power in disappearing into the dimly-lit stock room with a display shoe, leaving the customer waiting in socked feet in the wash of fluorescent lights. In the stock room, ladders ascended to the largest sizes, boxed near the skylights. To stand at the top was to stand in your own light beam like a deity. If you came to Mervyn’s for athletic shoes of any kind and asked me for advice, you probably left with whatever I thought coordinated best with the pants you were wearing. What I’m telling you is, I once sold shoes for a living and I know nothing about shoes. 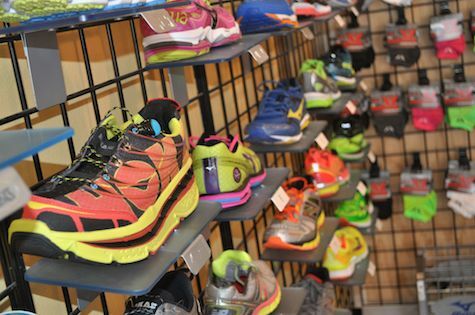 I do know this – if you want to get your Facebook friends talking, ask them what running shoe they prefer. This is how I found out that running shoes are serious business. And for good reason. When I first started walking for exercise, I wore the low-end sneakers Joe had picked up for me from a sporting goods chain when my feet swelled on chemo and I needed something in a pinch that I could walk around campus in the next morning. I’d told Joe to get any black shoe he could find, men’s or women’s. I didn’t care what they were. I just wanted them to be something I could shove my feet into that didn’t clash too much with my mostly-in-the-gray-spectrum work clothes. When I wore them everyday on long walks through my neighborhood, though, my feet started to ache, the sort of contorting-in-a-vice ache that wakes you in the middle of the night. Because I certainly know nothing about shoes, I asked around. Several people told me how much they loved their New Balance shoes. In the end, New Balance shoes didn’t work out for me, but the salespeople in the New Balance stores do offer to analyze your gait (this means you walk on a treadmill while a salesperson takes video of your feet in motion and not the elaborate “testing the Six Million Dollar Man” kind of thing I’d hoped it meant), determine your arch type, and assess the way you distribute your weight in order to match you up with the right shoe. The other plus: they allowed me to exchange my shoes and then return them altogether when it was clear after several walks that they weren’t exactly the right shoe after all. Other shoes people told me they loved: Saucony, Brooks, Sketchers, Asics Gel, Salomon, Alta Zero-Drop, and Newtons. So, basically all the shoes. So I found a local store in San Antonio, Solers Sports, that offers all of the analysis and a variety of brands to try on. “I like how you didn’t say ‘big,’” I told him. “You learn a few things when you work in shoes long enough,” he said.